Editor's Note: Two pieces from the series reviewed below may be seen during December as part of an exhibit, sponsored by the Gallery Walk organization, in the Robt. H. Gibson River Garden, 157 Main St., Brattleboro. During November, artwork by Kay Curtis was exhibited in Brattleboro's River Garden. Ten of the seventeen paintings in this exhibit brought art history, spirituality and a joyful sense of two-dimensional design together in one theme. The goal of Curtis's newest work was to illustrate the fundamental concepts of the "Covenant" of the All Souls Unitarian Universalist Church, which meets at the West Village Meeting House in West Brattleboro. To show reverence for the divine in all that is. Curtis created her easel-size paintings last winter using ink and gouache on watercolor paper. The pictures contain a surface depth created by the building up or layering of color. Titles for the paintings and the subject for each came from words in the Covenant that seem to capsulize and define, in a broad sense, the concepts involved in the All Souls congregation's spiritual contract. The words selected or adapted from the text and used as titles for the ten paintings were: love, community, responsibility, peace, celebrate, embrace, communicate, serve, share, and divine in all. These words, taken out of context, are large concepts indeed and, as a consequence, contemplation of the "Covenant" looms larger in the imagination of the curious. Curtis's intense graphic design orientation is softened by her use of light gray as a "ground" where someone else might have used white, but the gray, being a medium value, helps to set the limited value range which unifies the pastel color palette, flattening the space into an ordered and balanced two-dimensional arrangement. Varying black shapes and lines are used as part of figures and to define planes simultaneously, separating the composition into areas or zones. 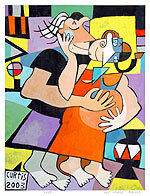 Faces, hands, and feet or legs are reduced to simple shapes and interspersed with the geometric color shapes. They overlap and intersect in ways reminiscent of certain cubist styles, pointing towards the Spanish cubist Juan Gris in particular. There is also a floating, antigravitational element of description, which might remind one of Marc Chagall's floating figures and animals in his paintings of Russian country life. 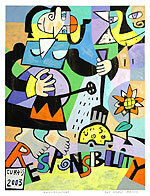 American painter Stuart Davis, whose colorful graphic designs incorporated letters and words as abstract elements, is strongly referenced in this work, as the actual words in Curtis's titles are included as part of each picture. The geometric elements of the letters blend nicely with the body parts and colorful shapes. Many of the heads are crowned like figures on playing cards, specifically Jacks or Kings. There is one female figure who wears a Russian babushka in the painting entitled "Community." Picasso's harlequins and the sad kings of George Roualt also seem to be consciously or unconsciously referenced. These kings, however, are celebratory and not sad. There is another repeated element which recalls Picasso. That is the use of small white birds, which singularly appear in many of the thematic paintings, obviously symbolizing "peace." Picasso was perhaps the first artist to use a dove as a symbol of peace. We know also that some of his first drawings as a child were of pigeons, many of them dove-like. Kay Curtis has abstracted her doves differently in different pictures, but the viewer easily recognizes the now well-known symbol. Other graphic symbols, such as stars and spirals, are less specific but affect the mood Curtis in an upbeat and sparkly manner. These colorful graphic compositions seem much like cut wood puzzles or stained glass windows, again reminding us of the playful and spiritual. Overall, the show's mood was joyful and idealistic while being both attractive and decorative, though the pictures seemed to be hung a little too close together to "breathe" as individual works. Basically self-taught as an artist, Kay Curtis has been exploring her creativity since the seventies, when she attended Goddard College in Plainfield, Vermont. After graduation, she moved to California and spent 25 years developing her skills as a painter and designer. She returned to Vermont a few years ago and settled in Brattleboro. Her idealistic, community-oriented artwork is a welcome addition to the local art scene, and we hope to see more of it soon. Photographic prints of the Covenant series are available on 5"x7" blank cards or in larger sizes for framing. Call Joy Wallens-Penford, 802-257-2616, for info.